Are Pushups Good For Losing Weight? 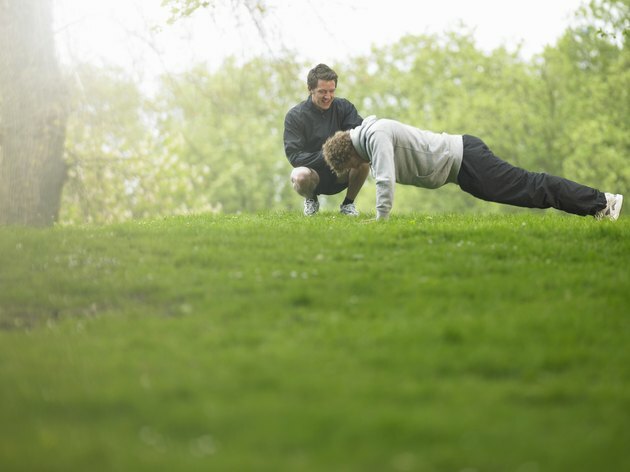 If you're trying to get in shape, your first step might be doing calisthenic exercises such as pushups. But pushups alone won't do much to help you lose weight. They can, however, be a part of a healthy muscle-strengthening exercise routine, and coupled with other exercises can help you improve your physical fitness. To lose weight, you have to burn more calories than you eat, and this may require as much as 300 minutes of exercise each week. Calisthenic exercises -- including pushups, lunges, squats and similar routines -- don't burn as many calories as cardiovascular exercise. To maximize your chances of weight loss, you should do activities such as running, cycling, swimming, jumping or aerobic step. Every time you move your body, you need calories for energy, so pushups do burn some calories. A calisthenic routine will burn about 135 calories in 30 minutes for a 125-pound person. However, you'd have to do pushups for an extended period of time, which may be nearly impossible. An aerobic exercise such as running 5 mph, by contrast, burns 240 calories in the same time period for a 125-pound person. The specific type of pushups you do can affect the calories you burn. For example, one-handed pushups and triangle pushups can be more challenging, building stronger muscles and burning a few extra calories. Although pushups won't help you lose weight as quickly as aerobic exercise, they can play a helpful role in improving physical fitness. The U.S. Centers for Disease Control and Prevention recommends that adults get at least two days of strength-building activities each week, and pushups can be a part of this routine. Additionally, muscle burns more calories than fat, so strengthening your arm and shoulder muscles through pushups can help to slightly boost your metabolism. For the best fitness and weight-loss results, try incorporating a variety of calisthenic activities and weight-training routines into your daily workout. Circuit training, for example, allows you to combine aerobic and muscle workouts. Try doing a circuit of pushups, lunges and squats followed by a circuit of running. Then do another circuit of weight training followed by a circuit of a different aerobic activity such as swimming.